In the mid to late 1990s, AR Designs led a trend acquiring and developing advanced technology to be applied to make an impact on disadvantaged and underserved communities. We partnered with national laboratories in order to license, co-develop, co-engineer, prototype and transfer the technology kernels which are now embedded in our community wi-fi networks and our Bandwidth Community portals. This technology comprises the necessary elements for the design, installation, monitoring of and control of any network system of devices and users. It is the result of years of research and development with the National Institute of Standards and Technology (NIST), the Department of Energy (DoE), the NASA Glenn Research Center (NASA GRC), Honeywell Federal Manufacturing & Technologies (FM&T), and The Community Builders (TCB). The following technologies were licensed and or co-developed by AR Designs and integrated into the framework of our wi-fi networks and Bandwidth Community portal technology. The idea was to provide an independent laboratory facility where manufacturers could work together and with NIST researchers in a cooperative environment to validate the then draft standard and to test and debug prototype products. All test results are confidential so that manufacturer are free to bring in prototype products without fear of negative publicity if problems are found. It was believed that this kind of environment would help identify problems with what was then a draft standard, help manufacturers develop BACnet products, provide valuable real-world experience conducting tests, and also help consumers who want to buy BACnet products today. Even though BACnet is now an established standard the work of the consortium continues, primarily by continuing to develop and refine testing tools and procedures that can be used to establish an industry-run BACnet certification program. The work of the consortium is closely linked to the efforts of ASHRAE SSPC 135 to create a BACnet testing standard. Assist control system manufacturers in verifying the correctness and interoperability of their BACnet implementations. 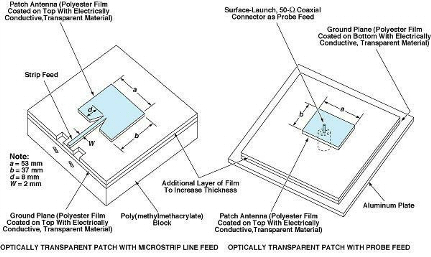 A class of transparent patch and slot antennas consisting of an ultrathin film of electrically conductive material deposited on glass or plastic substrates has been developed jointly by the NASA Glenn Research Center and the Federal Data Corporation. A prototype antenna has been demonstrated with the antenna fabricated on either glass or plastic substrates utlitizing this Optically Transparent Conductive (OTC) film. The antennas have demonstrated very broadband characteristics, good impedance matching, and radiation patterns for frequencies ranging from 2 to 30 gigahertz (GHz). We believe that these antennas can be further developed to operate in the Federal Communication Commission’s (FCC) newly opened, high-frequency bands above 30 GHz. Finally, a 2-by-2 array has been fabricated and is currently being characterized. Figure 1. Conductive Transparent Films on Glass Substrates can be deposited through photoresist masks in patterns required for antenna patches. Figure 2. 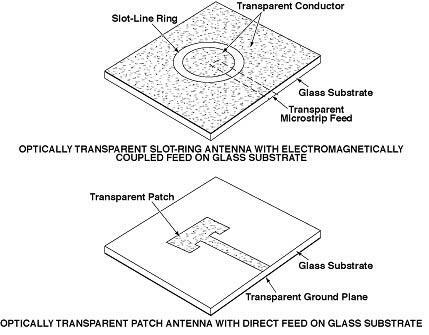 Coated Polyester Films Cut to Required Patterns can be used to construct optically transparent patch antennas. These are only two examples of the unlimited number of antenna configurations. The poly (methylmethacrylate) block and aluminum plate in these examples are used for mechanical support only; in a typical application, the support would be a window or other transparent object. to switch between wide area and local area networks via a single substrate material, and will offer protocol software allowing for customized solutions. The antenna will serve as a gateway and network medium for wireless internet access devices. AR Designs is focusing on integrating the antenna technologies into the optimal design format before scaling the design to device-on-a-chip size. Conformal, transparent printed antennas have advantages over conventional antennas in terms of space reuse and aesthetics. Because of their compactness and thin profile, these antennas can be mounted on video displays for efficient integration in communication systems such as palmtop computers, digital telephones, and flat-panel television displays. 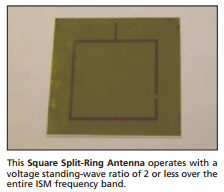 As an array of multiple elements, the antenna subsystem may save weight by reusing space (via vertical stacking) on photovoltaic arrays or on Earth-facing sensors. Also, the antenna could go unnoticed on automobile windshields or building windows, enabling satellite uplinks and downlinks or other emerging high-frequency communications. The goal of the project was to develop a wireless communications system, including communications, command, and control software, to remotely monitor the environmental state of a process or facility. Proof of performance would be tested and evaluated with a prototype demonstration in a functioning facility. AR Designs' participation provided access to software resources and products that enable network communications for real-time embedded systems to access remote workstation services such as Graphical User Interface (GUI), file I/O, Events, Video, Audio, etc. in a standardized manner. This industrial partner further provided knowledge and links with applications and current industry practices. Honeywell Kansas City Plant [FM and T's] responsibility was primarily in hardware development in areas such as advanced sensors, wireless radios, communication interfaces, and monitoring and analysis of sensor data. This role included a capability to design, fabricate, and test prototypes and to provide a demonstration environment to test a proposed remote sensing system. A summary of technical accomplishments is given.r the environmental state of a process or facility. Proof of performance would be tested and evaluated with a prototype demonstration in a functioning facility. AR Designs' participation provided access to software resources and products that enable network communications for real-time embedded systems to access remote workstation services such as Graphical User Interface (GUI), file I/O, Events, Video, Audio, etc. in a standardized manner. This industrial partner further provided knowledge and links with applications and current industry practices. FM and T's responsibility was primarily in hardware development in areas such as advanced sensors, wireless radios, communication interfaces, and monitoring and analysis of sensor data. This role included a capability to design, fabricate, and test prototypes and to provide a demonstration environment to test a proposed remote sensing system. A summary of technical accomplishments is given. We developed compatibility for integration with newer browser technologies. Tempest Embedded Web Technology (EWT), originally developed at NASA’s Glenn Research Center to support space shuttle and International Space Station operations, combines Internet, World Wide Web and real-time systems technologies. It enables the low-cost, real-time remote control and monitoring of embedded systems via a standard Web browser. Embedded systems contain computers, software, input sensors and output actuators, all of which are dedicated to the control of a specific device. EWT team first gained national recognition in 1997 with the introduction of Tempest, the first Web server of its kind for real-time embedded systems and the keystone for EWT applications. From 1997 to 1999, recognizing Tempest’s broad potential, Glenn hosted a series of workshops for companies interested in commercializing the server and associated technology. 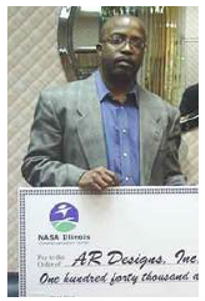 The EWT team earned the NASA Software of the Year Award (1998), the R&D 100 Award (1999) and the Federal Laboratory Consortium Award for Excellence in Technology Transfer (2000) for their pioneering work and technology transfer activities. EWT is now widely known in the software industry.